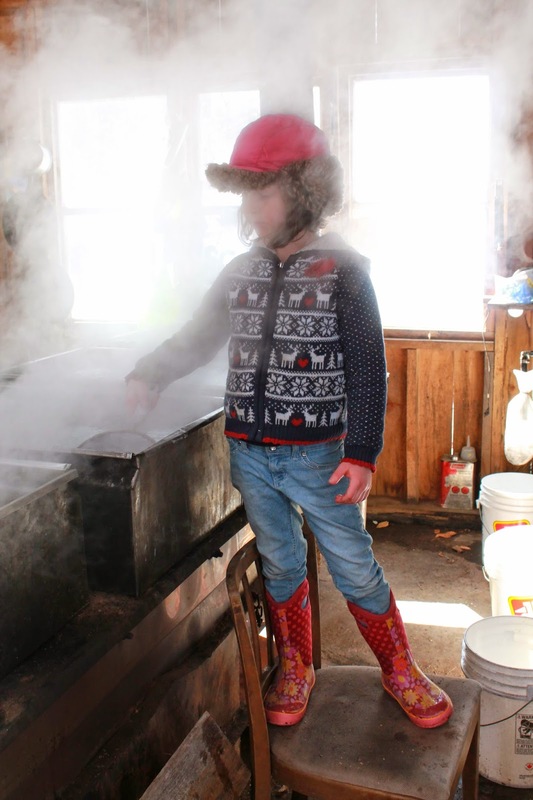 Margot skims the "sludge" off the boiling sap. The fruits of the morning's labour. Plink, plink, plink...the drops get faster as the day warms up. 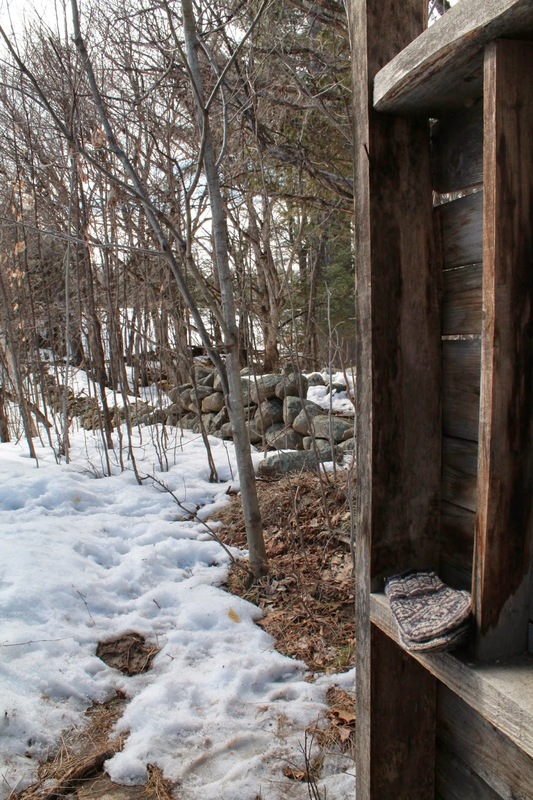 My view from the open-air outhouse...see my Dala horse mitts? Sleepy toddler finds a place to lay her head. This one wasn't feeling so well. ...and this one was just crabby. It hurts a lot when your feet start to thaw after a dip in ice-cold meltwater. 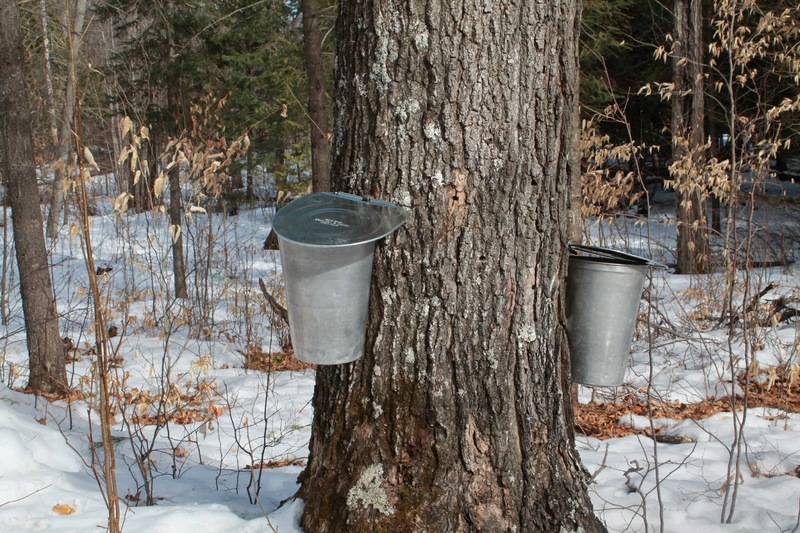 We have had seasons where the sap is running and done in February. 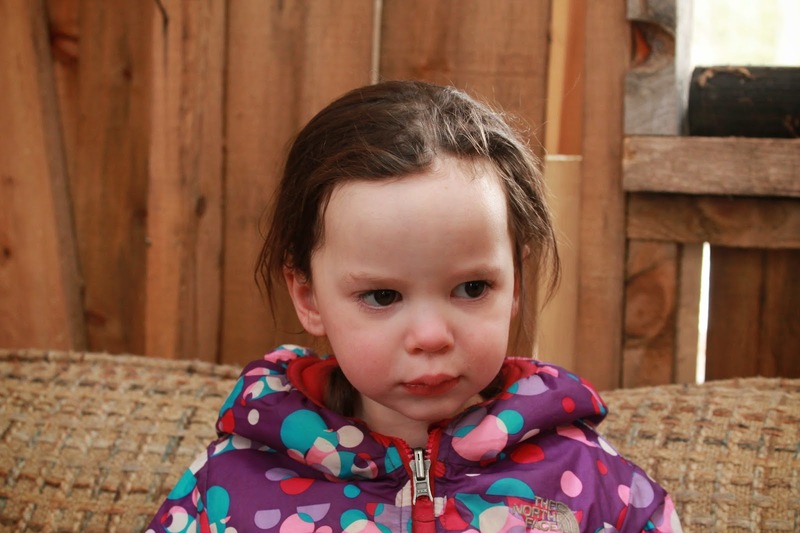 This year, the sap is just starting to run and it's almost April. 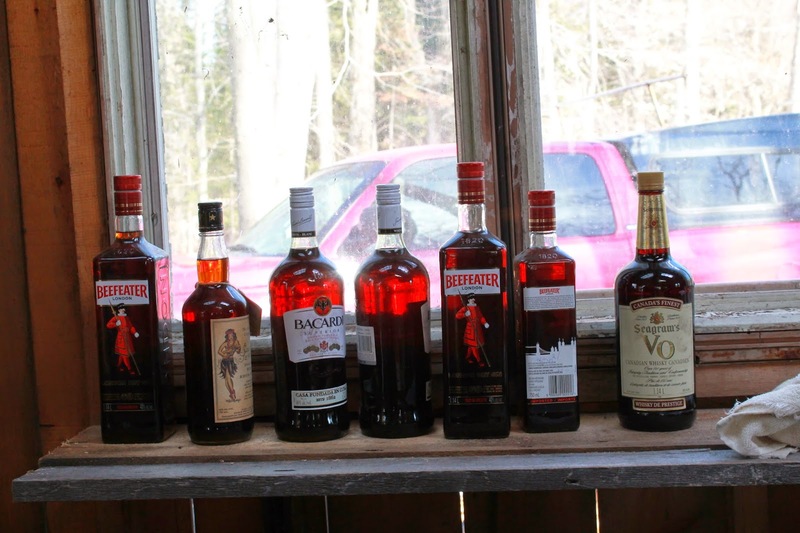 We don't tap trees of our own but the next best thing is having friends who generously invite us to join in the sugaring off. They graciously welcome us year after year: a gaggle of soon-to-be-muddy kids, two parents who always seem to be chasing a toddler or wearing a baby, and piles of food to share outside. Sugaring off season is beautiful for so many reasons. There is the quiet hush of sweet-scented sap that rises from the evaporators. Hot, strong coffee softened with this year's syrup, or simply, a mugful of hot sap for the children. The wind in the trees, the squelch of mud on our boots, the absolutely riotous mess-making of children who have finally been set loose on Spring. The stories that people tell when they are away from screens and telephones and deadlines have a focus and depth that is rich. There are layers of clothes that are taken off then put back on depending on what the sun is doing in relation to the occasional clouds that pass by. The women and some of the medium children head off on a walk across the fields, following the trails of skidoos that are slowly melting away. We notice the paths the deer take, different from ours, and marvel at the miles of stone fences that cross this region. 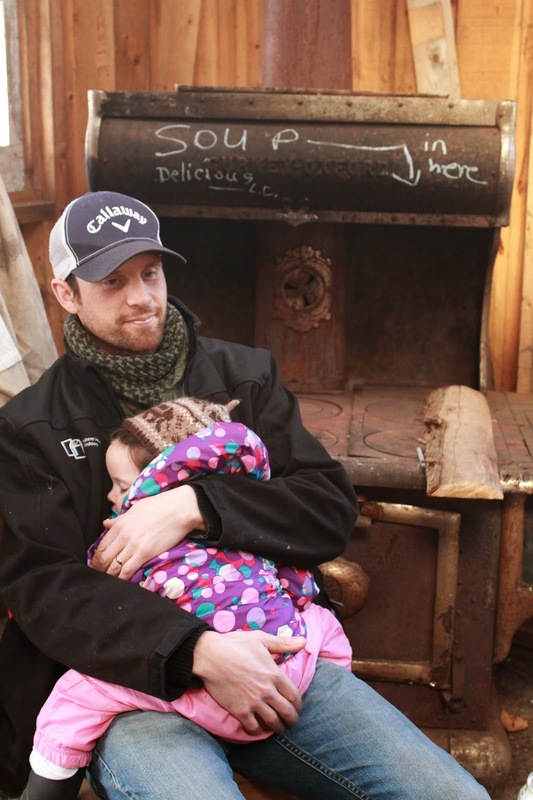 The toddler stays at the "cabane" (sugar shack), and when I get back, she is fast asleep against daddy's chest. The big boy went for a ride that has no name: a sled tied to the back of a skidoo. 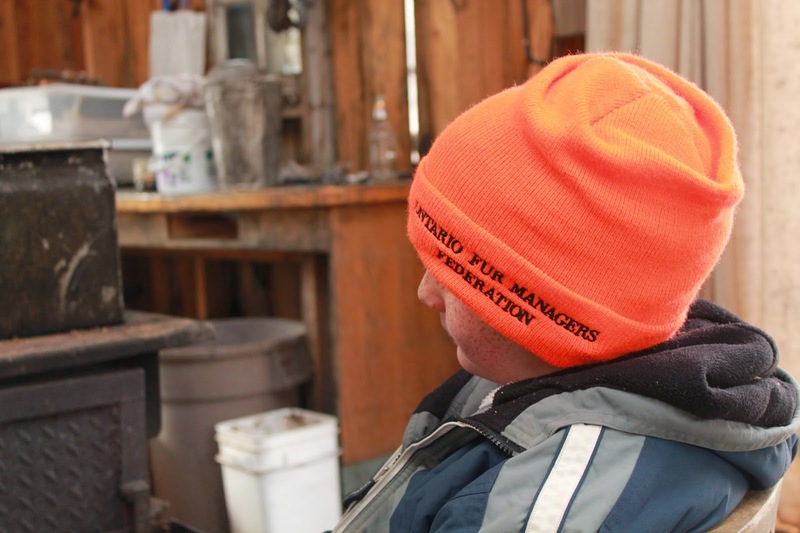 His feet are soaked and we have a few tense moments where the cold begins to seep into, then out of them as he warms them by the woodstove. My biggest girl has had a tummy ache all weekend so lays low on the old couch, nibbling whatever is set out on the old table that groans under the weight of food we all bring. 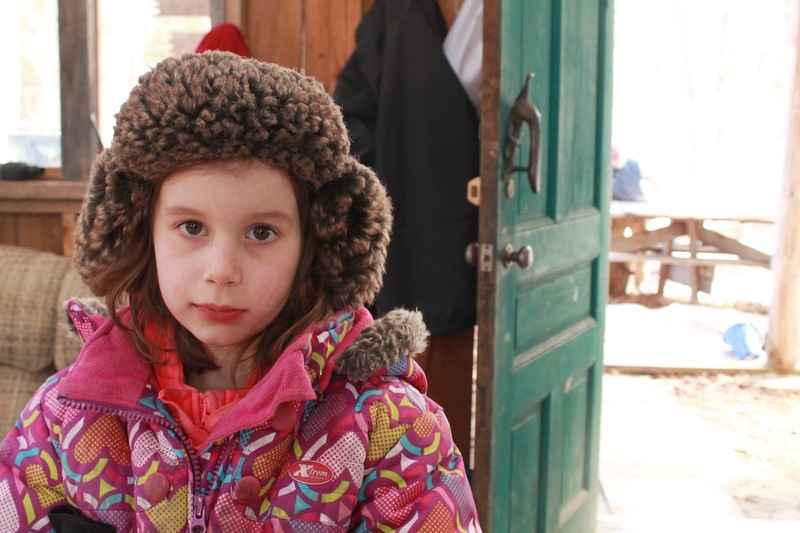 There is always a pot of something heating, and lots of laughter as we look back on how the children have grown, and how this operation has grown since the earliest days when they used to boil the sap in an old filing cabinet drawer over an open fire. 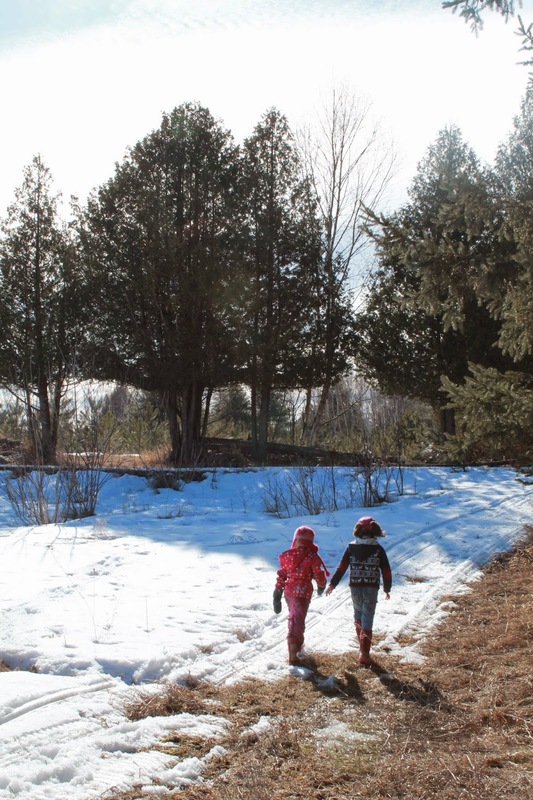 When everyone is full of sap and has a bit of a chill, we head home: filthy, exhausted, cheeks pink from sun and wind, hair sticky from syrup, dried sap caked on the kids' cheeks where they lifted the pails off their spiles for a sip. We bathe them in batches, tuck everyone into cozy pyjamas, and marvel once again at the ease with which they settle into sleep after a day of mud and sunshine. Glorious! I wish we had been there with you. Your description makes me feel like I was part of it, though. Wonderful! What a beautiful story. I'm glad to know the sap was flowing on your side. I've read from other bloggers that it's going to be a very short season. Lovely photos! Wish I'd been there with you.